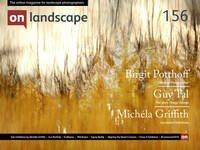 If you’ve been looking closely, the On Landscape photography conference, “Meeting of Minds”, it is still a couple of speakers short. That’s because we’ve been chatting with a few people about the possibility of talking at the conference and we’ve only just completed the process. If you’ve been to the conference before you’ll know that we have a mix of styles of photographer ranging through the romantic, sublime, documentary, contemporary, creative, etc and even non-photographers sometimes. (Why not watch our videos from our previous conferences) This is to try to expose our audience to the whole world of landscape and to hopefully give everybody something new to think about. When we were planning the current conference there were a couple of photographers that I really wanted to get involved but one of them is a little more ‘interesting’ to engage with than some. Alongside Thomas, we’ve recruited a climber turned photojournalist who, as well as founding one of the first MA courses in the UK, also set up the first residential photography workshops with the Photographer’s Place in Derbyshire. He also became the first art photographer to receive an MBE for services to photography and the first professor of photographic practice in a British university. Paul Hill has been at the centre of the growth of art photography in the UK and is still working hard not only as a photographer but as a volunteer helping in the refugee crisis in Greece. As well as working together on the first creative photography course in the UK, Paul and Tom also carried out an inspirational series of interviews with more than twenty photographers including Ansel Adams, Man Ray, Cecil Beaton, Brassai, Henri Cartier-Bresson, Andres Kertesz, Jacques-Henri Lartigue, George Rodger, Robert Doisneau, Herbert Bayer, Henry Holmes Smith, Helmut Gernsheim, Brett Weston, Manuel Alvarez Bravo, Eliot Porter, W. Eugene Smith, Laura Gilpin, Paul Strand, Imogen Cunningham, Wynn Bullock, Minor White, Henri Cartier-Bresson and Beaumont Newhall. The resulting book “Dialogue with Photography” is an essential read for anyone interested in the artistic process. These two photographers bring our line up to completion and we’re really looking forward to seeing this fantastic range of photographers talk throughout our weekend conference.